Hands up if you’ve heard someone in your office talk about using agile principles, working in sprints or choosing a scrum master? If you don’t understand what they mean, don’t panic. Agile concepts are relatively new to the charity sector and many organisations are still working out how best to adapt them. Agile is a project management methodology, well suited for building and maintaining software projects. The aim is to get working software to real users that meet needs as quickly as possible. We’re busting some of the jargon so you know what’s what on agile terminology. Agile is often contrasted to waterfall or PRINCE2 style of project management. The key difference you’ll experience when working with agile, as explained in this video from the Government Digital Service, is that you don’t over specify what the end product is going to be at the start of a project. Instead, you’re constantly building, testing and adapting. Traditionally for a waterfall project, you’ll spend a long time at the start of the project specifying precisely what you’re going to build. This works well if you’re building a bridge or a house, but if you’re building software it’s more useful to have some flexibility. You can start with a set of objectives and needs, build something then put it in the hands of real users, and refine it based on their feedback. This flexibility is especially important because technology changes all the time. With large projects, if you specify upfront what you’re going to build, there is a risk the product will be out of date by the time you’ve finished. The Agile Manifesto sets out the basic principles of working in an agile way. In a nutshell, individuals and interactions are valued more than processes and tools. Working software is valued more than comprehensive documentation. Customer collaboration is valued more than contract negotiation. Responding to change is valued more than following a plan. Processes, documentation, contracts and plans do have a role in agile, but only in as much as they help get working software to real users. Scrum is “a framework for developing and sustaining complex products”. You can use it to bring the principles of agile to life. It’s best explained in the Scrum Guide. Scrum is underpinned by principles of transparency. Simply put, it’s about being clear and open about what’s happening. This includes the inspection of work to ensure quality and objectives are being met, and adaptation, so things can be changed quickly if there is a problem or feedback demands a different approach. The scrum guide explains that work is divided into periods called sprints, generally one or two weeks, in which priority work is planned and delivered by the team. The sprint starts with a planning session, in which the team agree what work to do and how to do it. The team meets each morning for a daily scrum to discuss what has been done the previous day, what they’re going to do that day and, most importantly, to ask questions of each other and resolve issues. 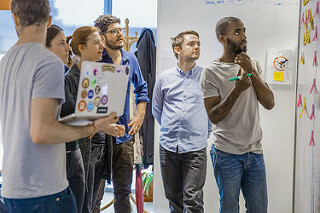 Each sprint ends with a sprint review where the team and stakeholders look at what’s been achieved during that sprint and to discuss what the next priority is. There is also a sprint retrospective where the team reviews how things have gone with tools, processes, people and relationships, and decides what to continue doing and what to change in the next sprint. The scrum guide also sets out a team structure with a product owner, scrum master and development team. If you’re working in an agile team, or seeing one work for the first time, you’ll see lots of tools and techniques that teams use to practically apply the methodology. They are not prescribed by scrum and teams often have favourites that work for them. For example, often a scrum team will sit together and will work around a whiteboard and use lots of post-it notes. They might have a digital version of their whiteboard in a tool like Trello. You might be able to spot the digital team in your office, surrounded by post-it notes! Teams might write user stories to explain what their users need and check whether their work is meeting those needs. They might use planning poker to estimate the effort required to do pieces of work. They might have burn down charts to map outstanding tasks and the time left to do them in. Agile is used by lots of agencies who build websites for the charity sector. Your organisation may already have worked on an agile project, even if you don’t usually work that way. Charities are beginning to adopt it internally too. Citizens Advice write about their work in agile in their digital team’s blog. …the key thing about agile is it not only puts the customer in the heart of what we’re doing, but actually puts the customer in the place of driving development. The easiest way to get started and start introducing agile to your team is to talk to colleagues who already use it. People who use agile are usually excited by it and will be happy to explain it to you, probably answering questions about what they do and why. After all, a key principle of scrum is transparency. Soon, you’ll be explaining the concepts to someone else who doesn’t have a clue. Rebecca Kemp runs an intensive training day in digital project management for charities, with Sarah Jackson of Kestrel Copy. The interactive training equips you with everything you need to know about managing a website project, from the very first steps to launch and beyond. Designed especially for staff in charities and nonprofits, it provides practical advice, expert guidance, strategies and resources to help you build the best possible website for your organisation. All the details available on the website, Charity Digital Training. Rebecca Kemp is a freelance digital director. She leads digital transformation programmes and consults on strategy, service design and agile. She’s passionate about putting users first, working in an agile way, and making colleagues and stakeholders part of digital transformation. Find out more about Rebecca at rebeccaindustries.com.